We’d love your help. Let us know what’s wrong with this preview of Blood Red Rose by Ginny Clyde. Lenara Gerrickson is returned safely home, but as she recuperates from her injuries, she can't stop thinking of the mysterious hunter who saved her life in the Hijkarden woodlands. As the next New Moon approaches, Lena prepares to return to the depths of Maldorfina's forbidding forests to gather more nightshade berries for her sister's healing potion. But in her weakened s Lenara Gerrickson is returned safely home, but as she recuperates from her injuries, she can't stop thinking of the mysterious hunter who saved her life in the Hijkarden woodlands. As the next New Moon approaches, Lena prepares to return to the depths of Maldorfina's forbidding forests to gather more nightshade berries for her sister's healing potion. But in her weakened state, she can barely wield her sword. Christopher, her enigmatic rescuer, reappears to save her from certain death; but this time, she will not allow him to vanish so easily. A series of events lead Lena to discover his true nature and identity. As she struggles to face the clash of reality and her feelings for him, a new danger brews in her home town of Ballorna. A nameless beast skulks in shadows as it tracks her every move, awaiting the chance to strike. 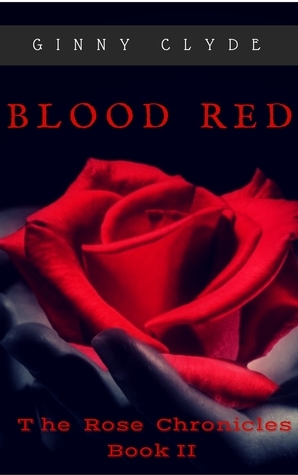 To ask other readers questions about Blood Red Rose, please sign up. Blood Red Rose picks up where Graveyard Rose left. And OMG!! It’s darker, and more intense! I couldn’t put it down!! I absolutely loved it! Holy intensity batman! What a fantastic emotion filled book! Old enemies return, New problems arise, secrets revealed and love found! Brilliant second installment and oh what and ending! Onto book two Robin!!! Blood Red Rose by Ginny Clyde picks up immediately where Graveyard Rose left off. In fact, it continues in such a way that those new to the series might find themselves a bit lost at first, but as the story unfolds they will be able to catch up and become engrossed in the story. Life for Lenora becomes more complicated as her story continues. Her father is called away to discuss the growing threat of the werewolves in the area leaving Lenora in charge of her family. But matters become complicate Blood Red Rose by Ginny Clyde picks up immediately where Graveyard Rose left off. In fact, it continues in such a way that those new to the series might find themselves a bit lost at first, but as the story unfolds they will be able to catch up and become engrossed in the story. Life for Lenora becomes more complicated as her story continues. Her father is called away to discuss the growing threat of the werewolves in the area leaving Lenora in charge of her family. But matters become complicated fast. A plot to kill her is hatched by a newly turned werewolf and a man she jilted years before. Ms. Clyde weaves a story of love and revenge that pulls Lenora and Christopher into a deadly plot and I was swept along with them to a point where I found myself cheering as Christopher saves Lenora. Blood Red Rose is merely the next installment in a larger story and like the first, leaves the reader wondering what will happen next. Blood Red Rose picks up right where Graveyard Rose ended, following Lena who gets caught in a complex web of love and revenge. The stakes get higher and higher as Lena fights to stay alive and keep her loved ones safe in this beautifully written paranormal romance. Author Ginny Clyde continues to captivate the readers with her elegant and descriptive writing that captures the reader's attention and whisks away to an unique world fantastical world. Really loved this book and couldn't put it down. Blood Red Rose picks up right where Graveyard Rose ended, following Lena who gets caught in a complex web of love and revenge. The stakes get higher and higher as Lena fights to stay alive and keep her loved ones safe in this beautifully written paranormal romance. Author Ginny Clyde continues to captivate the readers with her elegant and descriptive writing that captures the reader's attention and whisks away to an unique world fantastical world. This is a great continuation of the first book. I do suggest you read the first book before starting this one if you can, but if you don't you can still catch up fairly quickly as the author has done a good job weaving the pieces together in a cohesive manner. The plot of love and revenge thickens as an old lover comes onto the scene. Very heady stuff. If you're into the supernatural and the magic of fantasy, I think you'll love this one too. Looking forward to more from the author. I was given an This is a great continuation of the first book. I do suggest you read the first book before starting this one if you can, but if you don't you can still catch up fairly quickly as the author has done a good job weaving the pieces together in a cohesive manner. I am an indie author who started off with writing fanfiction. Nuada is my favourite fantasy character from Guillermo del Torro's movie Hellboy 2: The Golden Army and I just could not live with him being dead as in the original story. So, I started my own fanfiction story and gave a new dimension to his universe. I have a background in engineering but since last year, I have taken up writing and can I am an indie author who started off with writing fanfiction. Nuada is my favourite fantasy character from Guillermo del Torro's movie Hellboy 2: The Golden Army and I just could not live with him being dead as in the original story. So, I started my own fanfiction story and gave a new dimension to his universe. I have a background in engineering but since last year, I have taken up writing and can't seem to stop! I lived in Scotland for a while and there, I met real-life witches, gypsies and story tellers who introduced me to a world of magic and fantasy which made me realise that I have my own tales to tell the world.